Andrew Muhling (antiussentiment) a BGG user from western Australia, has gone off the deep end of boardgame geekiness by constructing a mold for making 90 pound cement yard Meeples. Let’s just hope he doesn’t start making them clothes and dressing them up like people do with cement geese and garden gnomes. Author mattPosted on July 28, 2008 January 27, 2016 Categories All Posts, Board GamesLeave a comment on Ultimate Geekiness? The Norwich Bulletin (CT) has posted a story about families finding fun with Eurogames. 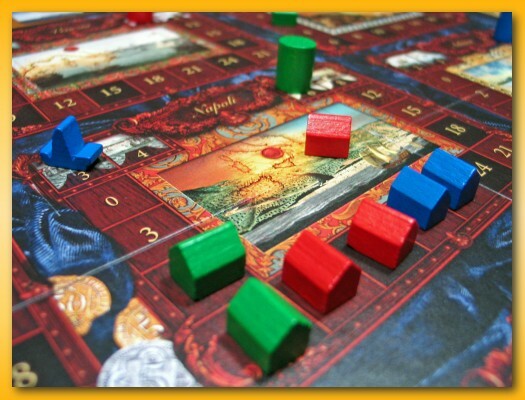 I like to see articles like this exposing the general public to the rich and rewarding world of boardgaming. Being marinated in games it’s humorous to see adjectives like “massive” used to describe a collection of 70 games. To the general public, 70 boardgames would be massive given that most homes have, at most, 6-10 games gathering dust in the closet or basement. 70 games would be ludicrous. But my collection, currently hovering at 100 pales in comparison to most “gamer geeks”. My collection is ultra tiny and I even run the risk of being called a poser! In a temporary swap for my copy of China I received a copy of The Downfall of Pompeii. A few nights ago, Noah and I played a sample game to learn the rules with each of us playing two hands of cards simulating four players. So with the rules down, I got Lisa to play with Noah and me this evening. The first half of the game requires each player to populate the board with as many meeples as possible. By playing cards, players place meeple on the board using straightforward-to-understand rules that drive your decision making, granting extra meeples, and at times allowing you to throw an opponent’s meeple into the volcano where they die a horrible death. 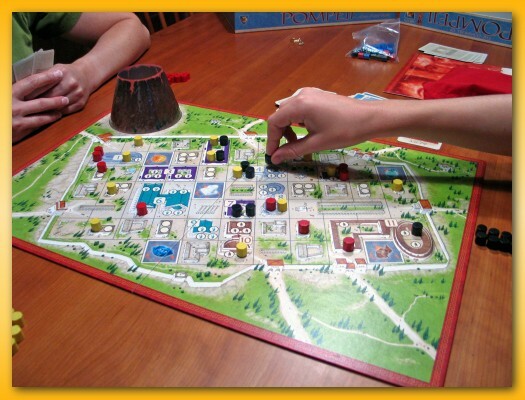 The second half of the game is played by drawing lava tiles from a bag, placing them on the board, and moving your meeples around on the board trying to march them out one of the seven city gates to safety. 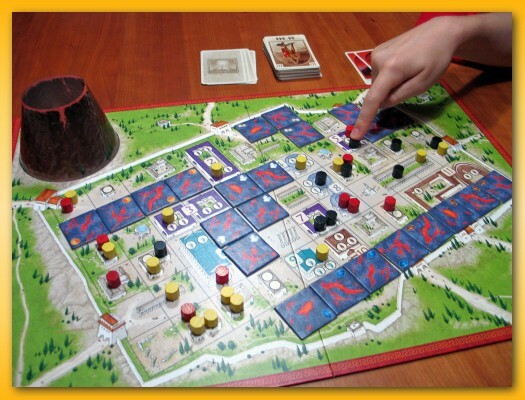 Lava, of course can be used to burn meeples (and throw them into the volcano) and to wall off exits effectively trapping them…becoming food for the voracious volcano. The player who saves the most of his meeples is the winner. Pompeii is not a cerebral exercise. Your decisions, although tense, are pretty limited in the first half by what cards you possess and in the second half by the limited number of moves you can make to drive your meeples to safety. Lucky and/or unlucky draws of lava tiles can easily eliminate your chances of escape but it’s still fun to burn up your opponents, seal off the gates they’re running for, and to toss them into the burning maw. We completed our game in about 45 minutes including the rules explanation so it’s a very quick game which is nice when you’re pushed for time and/or want something light to play. The components are well made but the plastic volcano feels like it might break after repeated bending to form the shape you see above (it fits down in a round hole through the board to keep it bent during play). I appreciate the colorful artwork that doesn’t detract from play by being overdone. I was amazed at the minute detail of the trees, horses, carriages, and people depicted on the roads leaving the city gates. Would I purchase a copy for my library? I’m not sure. If an opportunity dropped in my lap I might pick up a copy but I don’t feel like there is a hole in my collection without it. On the other hand, it’s a nice game to use to teach an alternative style of gaming for people only used to roll and move games. We’ve discussed changing what games we play and how we play them but alas we still play games and then let them set gathering dust effectively playing them for the first time every single time we play them. 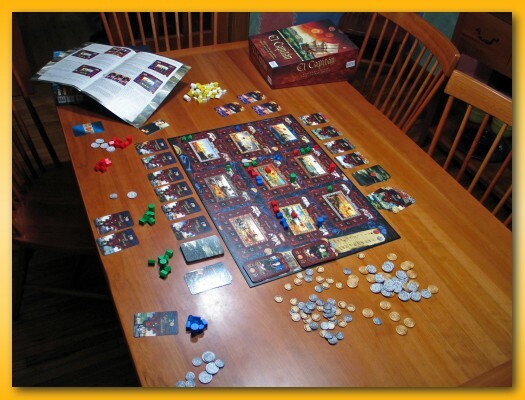 Aaron brings up some good discussion points in his post on Doubling Up over at BoardGameNews.com. For many people, there are so many games available that playing the same game twice in an evening often feels like cheating yourself of opportunities. I can really relate to this point. I only get one dedicated game night a month (sometimes I throw in an impromptu night) and it psychologically feels better to say I played two games on game night than it does to say I played one game twice. I used to upload lots of images to BGG but in the last few months I’ve pretty much checked out and ignored the feature. There are so many good photographers out there doing some really good stuff that I found myself not having the desire to compete so to speak. After getting my copy of Inkognito and noticing that there weren’t any good images of the Phantom of Prophecy (a.k.a. Nunzilla) I took a few shots and low and behold, the silly one has become hot and currently has 70 thumbs. Why do I do such silly things you ask? Taking pictures of board games? Okay, your right, it’s weird and silly, and I don’t have a good come back for that. It is what it is. Keith hosted the July installment of Analog Game Night and Tim, Keith, Jason, Rich, and I sat down to play El Capitan. It took about 15-20 minutes for everyone to feel comfortable with the rules but we got started in pretty short order. Three hours later (!) we finished. Yes, three hours! BGG lists the game at 90 minutes and we routinely run longer than average but three hours?! At its heart, El Capitan is an area majority game. At a high level, your trying to obtain and maintain the majority of warehouses (or second most) built in the most profitable cities while also trying to diversify in as many cities as possible. You also earn money by building fortresses in the cities. The player with the most money after the third payout wins. The game is played across three rounds with each round comprising a minimum of 7 turns. Each turn requires that the player build or take a loan from the bank. You must do one or the other. Before you build you are allowed to buy cards, play cards (to sail from one city to another), build either a single warehouse or a single fortress, and then optionally buy more cards. If you take a loan you do nothing else on your turn (are you reading this Tim? NOTHING ELSE! 🙂 ) but sail directly to the bank and take a loan card and the money the loan grants you. Each player gets a fixed number of bits (6 warehouses and 1 fortress) per round and the round is over when one player builds all of their bits. You get another batch of bits for the next round and if you didn’t build all of your items in the last round, you have more to use in the current round. During the first turn everyone is going to have to go to the bank. You just aren’t given enough starting money to build everything. At the end of the first round, a payout occurs and hopefully you get enough money to pay off your loan(s). If you don’t you have to extend your loan(s) and pay it/them off at the end of the next round. The artwork is lavishly rich. Normally that’s really cool but on this board, the extreme detail of scattered coins, folds of cloth, small works of unique art depicting the cities, stylized text, harbor embellishments, the unaligned nature of the cities, etc. distract the mind from quickly focusing on the game. The font used for the cities is awful. The highly stylized and thin stroked font is difficult to read at a distance. And the most egregious issue (for me anyway) was the strictly unidirectional board and cards. The board is rendered in landscape format readable from only one direction. The cards attempt to aid the player by depicting a 9×9 grid showing the location of the city but having to look at the board upside down I wanted to turn my cards over too but then I couldn’t read the name of the city. Forget about trying to distinguish Valencia from Venizia or Constantinople from Alexandria from across the table and upside down. Every turn required me to stand up and lean over the table to try to figure out what I faced with. Strangely though, I have to say I did like the game and look forward to more plays but maybe 5 is just too many. Or maybe the game only shines with 5 if you play with some of the included expansions (more city boards). We also thought it might speed up the game if we had a couple of sand timers and for every turn you don’t accomplish in an allotted amount of time, you have to pay some money to get an extension. So in summary, good game, somewhat slow, frustrating yet lavish art, want to play more, nice mechanics, lots of choices to make. I pulled out El Capitan this weekend and started going through the rules…playing some sample turns. El Capitan is a rework of a game called Tycoon. As I understand it, Tycoon came out on the heels of El Grande and due to El Grande’s success, Tycoon was largely overlooked. Wolfgang Kramer was involved with both designs. El Capitan has been rethemed, and with some new rules and artwork by Mike Doyle the game got a fresh start. This area control game requires the players to sail their ships from one harbor to another across three rounds building warehouses and fortresses. 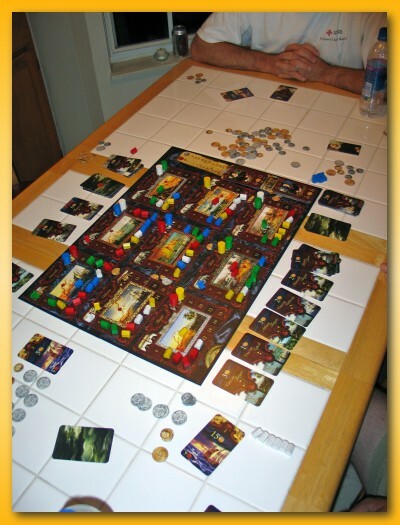 Three payouts occur during the game where players receive money for the most warehouses in a particular city, for fortresses, and for diversifying in as many cities as possible. There are some interesting twists when warehouses get closed when new warehouses get built and how the payouts in each city change over time. The ability for players to sail from one harbor to the next is also limited by what cards are available. On your turn you optionally sail (unless forced to) and then build a warehouse or a fortress. If you don’t have enough money to purchase a ticket to the harbor you desire or build a structure, then you are forced to go to the bank and take out a loan. Money seems like it will be very tight in the game and players will need to watch out that they don’t overspend their ability to payback the loans the take from the bank. I’m hoping to get it to the table soon and I’ll have more to say on it after I get a play under my belt. At IGS III I got my first opportunity to play Pandemic. Bob, a gaming buddy of mine whose copy we played, is a relatively new gamer with the buying bug and he allowed a temporary swap of my copy of Mexica for his copy of Pandemic. If you’re familiar with the game, you can jump forward a few paragraphs. However, if you’re not familiar with the game, the game is probably different than most games you’ve played in the past. It’s cooperative. By that, I mean that rather than there being one winner and the rest losers, all players either win or all players lose. As a group, you cooperate to try to beat the game. You take individual moves but you coordinate your moves to make it easier to accomplish group goals. Think of it like ganging up on the leader. However, in this case, it’s the game you’re ganging up on and not a human so there are no hard feelings. Pandemic has a rather morbid theme but one that fits nicely with the cooperative style of gaming. The game represents disease, sickness, flu, and plague and its desire to sweep across the globe from one city to the next infecting as it goes. The impact of the disease escaping the boundaries of a city in an outbreak can trigger unchecked growth much like a real world pandemics. Your goal as scientist, researcher, etc. is to work together to find cures and to eradicate the diseases before they run wild. There are only so many turns to do that and if you don’t find the cures before time runs out…you all lose and the game wins. Who wouldn’t want to work together against pestilence and death?! I’ll not go into the rules as they are readily available on BGG for those that want to find them but suffice it to say that I’m hooked on the game. I don’t have a cooperative game in my collection and having played War of the Ring and Shadows Over Camelot I want Pandemic on my shelf. WotR and Shadows are dripping in theme but have a more geeky/fantasy/role-player theme that won’t appeal as much to 1) my wife and 2) the crowd of non-gamers that I think would enjoy the cooperative style. I believe many non-gamers shy away from games because they suspect that they’ll appear inadequate or don’t want to look silly during a cerebral ‘event’. However, with cooperative play (and especially with a non-fantasy theme) they can participate with fellow players (not against) in a game that doesn’t feel like they’re turning into a 42 year, goth, geek that still lives in the basement at his parent’s house. We were confused about the Share Knowledge action and thought to pay for passing a card between players you had to discard a card matching the city you’re currently occupying freeing you to pass whatever card you wanted. That’s totally incorrect. Instead, if you are not playing the role of the researcher, you’re restricted to giving only the card that matches the city you’re currently occupying. If you are the researcher, you are not restricted and are allowed to give any card you wish (excluding Special Operations cards – this restriction only occurs in a rare yet valid corner case concerning hand limits yet still not allowed). We could have used that a little bit more to our advantage had we gotten that one right. When an Epidemic card is drawn, the city that suffers the addition of the cubes comes from the bottom of the Draw deck and not the Discard deck. This rules misstep drastically changes the cruelness of the game in that the epidemic will come out into a city that has previously suffered disease increasing the likelihood of an outbreak. We were drawing the city card from the bottom of the infection discard pile. The rules state that the game is not a game of memory and you’re free to look through the discard pile. So…we did which meant, due to the previous rule infraction, we could predict where the next epidemic would hit. I should have known something was amiss but…I was being taught the game and had not read the rules myself. And finally, if you draw an Epidemic card during the 2nd phase of your turn, we were drawing another card as a replacement. This error had the nasty side effect of making the game end sooner making it even harder to win. You should only draw two cards and if one or both (heaven forbid) are Epidemic cards, then you just lose out. The rules state that at any point in time if a player has more than 7 cards, the player must immediately reduce their hand to 7 or less by discarding or playing Special Operations cards. So, when were were drawing our two cards in the second phase of our turns, we’d draw them one at a time notice that we had 8 and discard…then draw our second card. However, that’s incorrect. The act of drawing your two cards is an inseparable operation. The designer chimed in on a forum post stating that you should draw two cards simultaneously and then resolve hand limit violations and then any epidemics (if drawn). I felt pretty good about the second game and tonight Lisa gathered Sophie and Noah and told me she wanted to play again as a family. This time the Medic was not in play and as luck would have it I got to play as the role I hadn’t seen in action yet: the Dispatcher. Of course we played a couple of turns incorrectly when I not only moved Sophie’s pawn (using the Dispatcher’s special ability) but I also removed cubes in the cities where her pawn was. Sensing something amiss, I ran to BGG and found the error buried in a forum posting and we played the rest of the game correctly (I think). Again, we played the easy form of the game but were only able to win on the very last turn of the game. As the next to last player I was able to dispatch Noah to Sophie (the Researcher) who was also in a research station. Then on Noah’s turn he was able to get two black cards from Sophie that matched the two he already had and since he was both the scientist and at a research station he was able to cure the final disease for the win. Awesome timing given that there were only two cards left in the draw pile. So, do I like Pandemic? Yes! Would I recommend it for non-gamers, families, and kids? With enthusiasm! The theme, although odd at first blush, is not gruesome. The artwork is not gross. There are no depictions or plague-ridden corpses or anything. The theme, in fact, enhances the play because it represents a real world foe. I believe the cooperative play joined with the realistically themed common enemy actually enhances the appeal of the game making it a great opportunity to open up the gaming experience to those around you that might not necessarily be inclined to play. Lisa did mention that she might like it better if the map was a non-real world map and the cities were not recognizable but, in my opinion, that aspect enhances the game somewhat by keeping the theme grounded in the real world. For new and/or non-gamers finding Sydney on the map in order to infect it with a disease will seem more normal than trying to infect, for example, Rivendish on the planet Under Earth. I am, however, not all that fond of the artwork and would like a larger board. Sometimes it’s hard to manage so many cubes in a tight area with lots of cubes and research station. Also…they left of New Zealand which is just wrong. 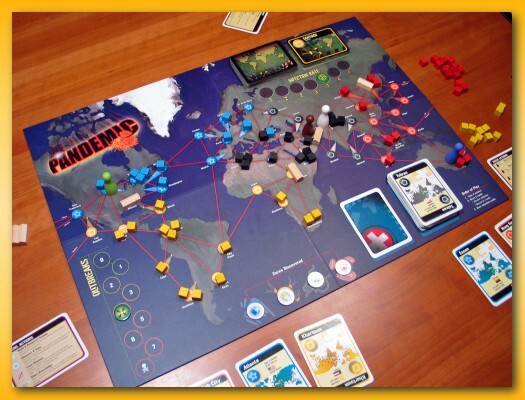 Pandemic is relatively difficult to find at the moment but more copies are expected some time this month in most online stores. However, after exchanging a few emails I was able to capture a ding and dent copy from Game Surplus that should ship in the next day or so. I’m willing to tolerate a scuffed box to pick up a copy for only $19. If you’re looking for a different gaming experience where the entire family can cooperate and learn to work together to solve a complex problem while having fun, then look no further. Pandemic is the game for you. Cooperation and Engagement: What can board games teach us? 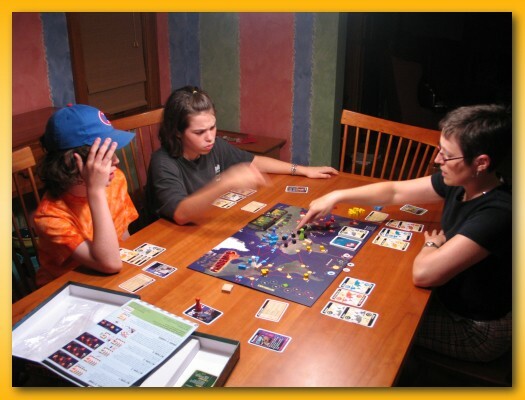 Author mattPosted on July 2, 2008 January 27, 2016 Categories All Posts, Board GamesLeave a comment on Cooperation and Engagement: What can board games teach us?